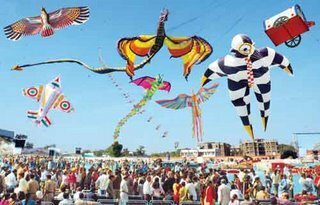 International Kite Festival is held every year on 14th of January at Ahmedabad to coincide with the festival of Uttarayan or Makar Sankranti. Makar Sankranti is a festival that heralds a change of season marking the movement of the sun into the northern hemisphere - a celebration to mark the end of winter. The skies are blue and clear, a cool breeze blows and a feeling of anticipation and joy grips all who celebrate the occasion. In Gujarat, Makar Sankranti is celebrated as the kite-flying day. Kite-flying day in Gujarat is an extraordinary day, unlike at other places. Ahmedabad, as a Gujarat's premier city, leads the way in the celebration of Uttarayan, and is the venue of the International Kite Festival. The festival is a time of thanksgiving for the religious, since it marks the awakening of the gods from their long slumber. The gods who are believed to have slumbered for six long months are now awake and the portals of heaven are thrown open. It is also a signal for merry-making. The temples are thronged with visitors and alms are distributed freely. From dawn to dusk, people of all ages fly kites rejoicing in the spirit of the day. The blue January sky is enlivened by kites of different colors and hues. Kites soar in the sky, their lines moving as if alive. 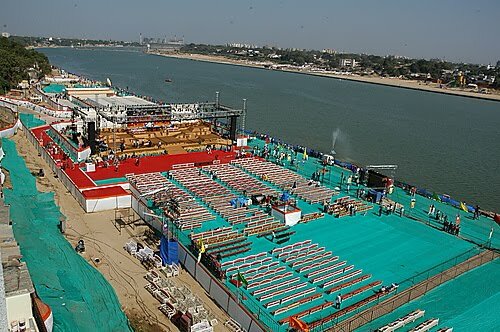 Crowded rooftops, fun-loving rivalry to outdo each other, and delicious Gujarati feast are the hall-marks of the day. A tremendous variety of kites are seen with friends, neighbors and total strangers indulging in kite fights. The nights see the arrival of the illuminated box kites, often in a series strung on one line, to be launched into the sky. Known as Tukkals, these kites add a touch of splendour to the dark sky. 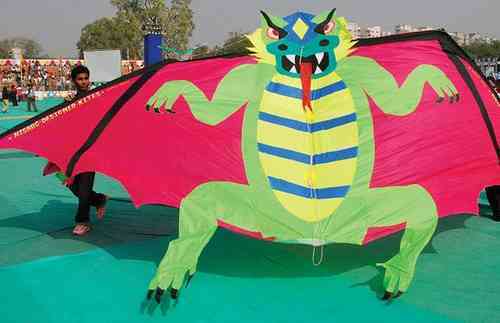 The festival draws expert kite-makers and flyers not only from cities of India but also from around the world. Special mixtures of glue and ground glass cover the lines with which the kites are flown. Experts specially prepare these lines before the great day. They are dried and rolled onto reels known as 'firkees'. Unless used carefully the strings are sharp enough to cut a finger.